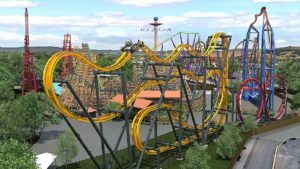 Six Flags Discovery Kingdom, Vallejo, California, will introduce DC Universe, a newly themed section of the park where guests will find themselves immersed inside a DC comic book-inspired world. 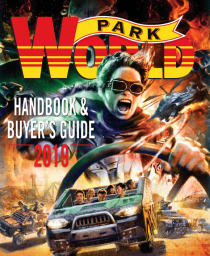 This themed section will feature the park’s most innovative roller coaster to date, Batman: The Ride, Northern California’s first 4D free fly roller coaster by S&S – Sansei, and the newly reimagined The Flash: Vertical Velocity, a high-speed launch coaster. These two thrill machines join forces in DC Universe with a lineup of existing branded attractions including Wonder Woman Lasso of Truth, Superman Ultimate Flight, and the rogues’ gallery of Super-Villain-themed attractions, The Joker, Harley Quinn Crazy Coaster, and The Penguin Ride. Headlining the DC Universe branded section this summer is Batman: The Ride, a fantastic, weightless coaster experience that features six free fly inversions. 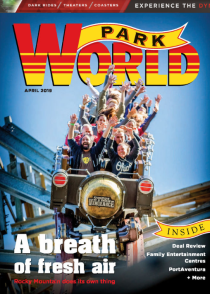 Other highlights of this adrenaline-pumping coaster include one-of-a-kind onboard magnetic technology featuring smooth, head-over-heels free-fly flips, giving guests the feeling of weightlessness as they soar outside the confines of a traditional track. There are 4D winged vehicles that extend outside of the track and seat eight riders per vehicle. Face-off seats allow riders to face each other as they tumble head-over-heels. A 120 foot (37 m) tall, 90º vertical lift hill and two beyond 90º “raven” drops give the sensation of free-falling. Also debuting in 2019 is a guest favorite thrill ride formerly known as Vertical Velocity, an Intamin Impulse coaster. It has been re-themed as The Flash: Vertical Velocity. Featuring new thematic elements, this spiraling, suspended coaster uses an advanced electromagnet propulsion system to shoot riders from 0-60 mph (0-97 kph) through a myriad of movements including fast straightaways, corkscrew inversions and up a 150 foot (46 m) tall vertical tower. The DC Universe themed area will also offer a host of new food, shopping and entertainment options. Guests can satisfy their inner super hero or super-villain at The Daily Planet, The Joker Funhouse Shop, or the new Batman-themed retail store. For those super appetites, Quick Quenchers Refill Station, and Big Belly Burger, featuring mobile ordering, will be ready with hot food and cold beverages. Members of the Justice League will also be on hand for meet-and-greet and photo ops throughout the day.